In this series we have been sharing stories about the people and places where The Handwork Studio team members find inspiration for their craft. In order to expand our community we will explore the different ways that people got their start in sewing, knitting, and other needlework crafts. This series explores the art that goes behind this craft and understanding the sources of inspiration for different people, and this week will be introducing you to Tim Pence! There can be this assumption within handwork that one is taught these skills at a young age and has then stuck with that craft ever since. For some, however, needle arts can come later as a result of their passion for creativity and art. For regional camp manager Tim Pence, his connection to needle arts did not come until more recently. Before he found his passion for sewing in undergraduate school, he seemed to dip his toe into many different creative fields within the world of visual arts. Tim’s creativity was discovered at a pretty young age as he and his brother became big fans of the He-Man cartoon and the Oz book series. “We took this to another level by creating elaborate storylines for our toys and improvising the outcomes,” and Tim said that ultimately, he loved being able to create a different world to play in. In his earliest memories, Tim fell in love with drawing and the kind of limitless places that it could take his imagination. He specifically really found a passion for drawing comics. When he was in third grade, Tim says that two of his friend in elementary and middle school would spend a lot of time creating comics. He and his friends “took this pretty seriously,” and in that time wrote and drew many different stories that seemed to spark a slightly embarrassed laugh from Tim even today. Although Tim mentioned that these were maybe not the most groundbreaking pieces of work, he stated that it was a great way to get his ideas out when he was younger. This love of drawing and creating comics was just the beginning of Tim coming to understand not only what art means in a general sense, but what art means to him. As mentioned, Tim says that when he was doing needle work in college that was the time he felt really connected to needle arts. 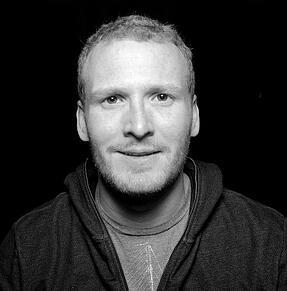 Now, as a MFA candidate in Theatre Set Design at Temple University, Tim feels as though he is finally being able to draw all of his influences into his work in lots of new and interesting ways. His program has been a great way to apply what he has learned to incorporate all of the senses into his work, and he feels as though he is able to reach a larger audience. 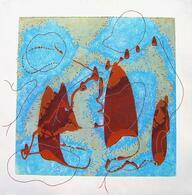 “I think I have done a lot of exploring with different materials, processes, and mediums. Theatre design sort of gives me a context and a way to process all of it. 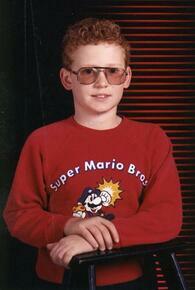 I have been building up a vocabulary and now I have been finding a place to use that vocabulary,” said Tim. When asking what has inspired his work, he said that one thing that he really looked to for inspiration was the music of Kate Bush, which he discovered in his early twenties. Even though he has never worked with music himself, he thought that her use of metaphor and the way she talked about her music was something that helped him “discover what art was.” It is interesting to see how music could inspire his work with visual art. Tim said, “I’m most transported by music as an art form, though I’m not a musician. It’s my goal to transport others in the same way, but through an immersive visual experience.” Along with her music, Tim said he is also inspired by relationships, nature, and the different materials he encounters. Making art has become a huge part of Tim’s life, and something that has ultimately brought him to The Handwork Studio. While working towards his degree, he has loved being able to teach kids to hone in on their own creativity and introduce them to handwork. Allowing kids to access their own creativity is something that Tim sees as being very important. “It’s not something they would be learning in school to this degree. So, to be teaching them so many different things and watching them do things for themselves is really rewarding.” While teaching kids today how to grow in their creativity, he is also always looking for ways to improve and grow within his own craft. Click here for a look at our summer sewing camp options for your child. Also, be sure to check out our store and our new partnership with Simplicity Sewing Patterns! In this series we have been sharing stories about the people and places where The Handwork Studio team members find inspiration for their craft. In order to expand our community we will explore the different ways that people got their start in sewing, knitting, and other needlework crafts. This series explores the art that goes behind this craft and understanding the sources of inspiration for different people, and this week will be introducing you to Ana Castro! When asking studio administrator Ana Castro about the moment she caught the crafting bug, she paused for a moment, and attempted to trace herself back to that singular moment. After lingering over the thought, she responded, “Well, I never wanted to be anything other than an artist,” which truly speaks to the meaningful way in which Ana has viewed the journey of her craft throughout her entire life. Some people can pinpoint an exact moment when they were taught a certain craft, or maybe trace it back to a certain person, but for Ana, it seems that creativity has been at the forefront of her life from the very beginning. Ana has always been surrounded by creativity, and a lot of her inspiration today comes from her Costa Rican background. The colors and textiles that come from that area really inspire a lot of her work, and she loves to infuse the styles of their traditional interior design into the pieces she creates. Along with her Costa Rican background, Ana also finds a lot of inspiration, especially when it comes to her color palate, from the style of the 90’s and the different toys she had when she was growing up. So, while one side of her pulls her towards the image of the traditional Central America home, another brings her towards her childhood in the states. Growing up, Ana said she spent a lot of time by herself, therefore finding imaginative ways to express herself. 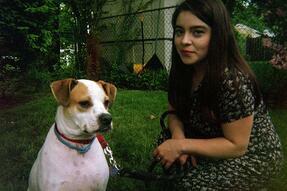 “I’m an introvert, and you know a lot of people wouldn’t realize that when they meet me,” said Ana. A lot of her work is then inspired by the kinds of activities she did when she was younger, while discovering who she was. 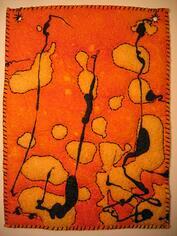 Most of her work is inspired by the body, and by movement and dance specifically. She says that a lot of her pieces mimic this sort of fluffy and plump feeling. Although never fully realizing it, Ana sees now how her childhood has found its way naturally into her work today. Another part of who inspired Ana’s creativity growing up were her parents. Both of her parents are chefs, and she said that seeing them be creative helped foster creativity within herself. “They were so resourceful, and everything had to be made a certain way,” mentioned Ana, and it was the ways in which they always thought outside of the box which allowed her to think that her career as an artist could be what it is today. Now, Ana embraces the meditative practice of her craft and loves being able to pass on these fiber arts techniques to kids today. “The projects they make become a part of their life in a much different way than store bought toys. We give kids the autonomy to pick every single part of their piece out, and that way they will value it so much more highly,” she said. By giving kids the opportunity to make these crafts a part of their life, Ana believes that more and more kids will be able to find ways of expressing themselves in the creative ways she did growing up. In this series we have been sharing stories about the people and places where The Handwork Studio team members find inspiration for their craft. In order to expand our community we will explore the different ways that people got their start in sewing, knitting, and other needlework crafts. This series explores the art that goes behind this craft and understanding the sources of inspiration for different people, and this week will be introducing you to Julia Yosen! After graduating college with a fine arts degree, Julia Yosen found herself at a quarter life crisis asking herself, “What am I supposed to do with this?” This all too familiar end of college standstill is something that a lot of art students face, and leaves many with the question: well, what about teaching? For Julia, teaching seemed to be the best option, but in that choice lies a path that she believed to be quite limiting. Julia moved from Vermont back to her hometown in Pennsylvania in 2006, and it was while she was working at a Joann Fabric, that The Handwork Studio fell into her view. An almost serendipitous job opportunity was presented to her, and in that job, she could connect some of the many things that she feels connected to and is so passionate about. Melissa, a teacher at the Handwork Studio, connected with Julia while she was working at the cutting counter at the Joann Fabric. Melissa opened up an opportunity to get in on the ground floor of something that would “revolutionize needle arts.” With a dream to connect a new generation of kids to needle arts, Julia jumped at the prospect of being an instructor for one of the first workshops and programs The Handwork Studio ever held. That was when her start with The Handwork Studio began, but her connection to needle arts and crafting goes back a little earlier. Julia first fell in love with crafting as she walked through the aisles of an A.C Moore. The arts & craft store’s endless creative possibilities excited the crafting gene in Julia. Two of her best friends and her would go down into her basement and move from one project to the next, which mimics the kind of collaboration and creative exploration that she would be facilitating at The Handwork Studio camps some years later. Whether it was making clothes for their American Girl dolls by cutting up a box of their old clothes or making pig puppets they found in the back of the book, The Wonderful Pigs of Jillian Jigs, they were never short of crafts to tackle. “It was always the three of us in our basement, making all of these terrible projects. We would stay down there for hours,” said Julia, and it was here that she caught the bug for crafting. As a kid who would always be starting her next project, Julia believes that there is something so empowering about creating something on your own. When you use your own hands to create something, there is a lot of pride that goes along with that. Julia did not discover her love for arts and crafts on her own but dedicates a lot of it to the things her mother and grandmother taught her when she was young. Julia said her mother was always crafty, and her grandmother was a great painter who also taught her how to cross stitch. Although she says she was not that great at it, there is still something so powerful when having someone teach you a craft such as this. Although she originally thought teaching was something quite limiting, Julia has now come to understand the power of teaching needle arts to those who may not have had the same childhood she did. “You want to be that inspirational person for these kids, and you want to create that environment where they are going to be excited about what they are doing,” says Julia while discussing her passion for working with The Handwork Studio. Even though it may not be where she thought she would be, having the ability to inspire a new generation of crafters fills Julia with an undeniable excitement. Julia believes that a lot of this creativity starts off “when we were little, and we are crafting and exploring,” and over the years, Julia has helped many little ones find their own creative gene within. Looking for a fun, unique way to be creative with your family? How about a cheap and eco-friendly one? Try upcycling, the perfect combination of originality, creativity, and sustainability for you to try with your kids. Read on to find out what it is and how you can do it at home. Upcycling is the reuse or repurposing of an old object into a product that is more useful or more beautiful than the original. Upcycling can be super simple and kid-friendly -- for example, instead of throwing out old CDs and magazines, you can make them into mosaic picture frames and woven coasters. It can also be more complex, such as repainting and repairing a piece of furniture instead of kicking it to the curb. You may be thinking, “Why should I take the time to upcycle? Isn’t recycling good enough?” Well, there are a lot of reasons why upcycling is so important. First, let’s establish the difference between recycling and upcycling. While recycling involves breaking down material to be reused (which decreases the material’s value), upcycling is all about finding new, creative ways to reuse the material (thus increasing its value)! 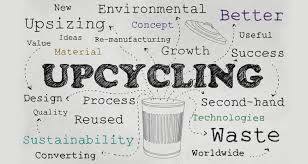 So, like recycling, upcycling reduces the amount of landfill waste you generate; however, upcycling also creates a new product that has a functional and/or decorative use. Next, let’s talk about waste. Remember that helpful catchphrase that everyone uses when talking about how to be more eco-friendly? Reduce, reuse, recycle! Well, I recently learned that these three actions are actually in order of importance. First and foremost, we should make the effort to reduce the amount of things we buy and resources we use (i.e., taking shorter showers and avoiding impulse purchases that we don’t really need). Next is reusing, which includes upcycling! Last is recycling -- so, while it's obviously important to recycle, it is more important to prioritize those first two steps over recycling. What Can I Upcycle? Why Should I Upcycle Clothes? Upcycling can be done with any object or material you can think of -- if you can repurpose, modify, or personalize it, you can upcycle it. For this post, I decided to focus on a popular material of choice for "upcyclers": clothing. Clothing is a great medium for upcycling because it is versatile, available, and can be modified in an infinite number of ways. Clothing is also a big issue when it comes to keeping our planet clean. In 2014, the U.S. alone generated approximately 32.44 billion pounds of textile waste even though 95% of all textiles have the potential to be reused or recycled. This number will only continue to increase unless we raise awareness of this issue and the different ways we can reduce, reuse, and recycle clothing. Now that you’ve learned how upcycling is an economical, eco-friendly, and creative activity, you must be ready for some inspiration! Whether you have thrift store finds, hand-me-downs, or old clothes of your own, here are 10 different ways you can upcycle them with your kids. 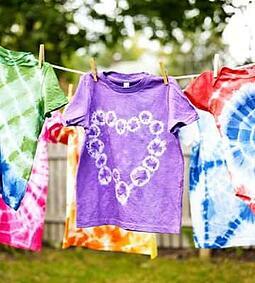 Tie-dye is a fun, kid-friendly way to upcycle that never goes out of style. This easy DIY will instantly upgrade any plain, light-colored clothes (and it can camouflage stains). Dye a t-shirt, tank top, skirt, pair of leggings -- or even accessories like headbands or socks! Thinking outside the box is encouraged. Let your kids’ imaginations lead the way as they combine colors and patterns into their own custom work of wearable art. Check out this guide to tie-dye for plenty of tips, tricks, and pattern ideas. Don’t have any white clothes laying around? Don’t worry! If you have solid-colored clothing, try tie-dyeing with bleach for a new twist on this classic activity. 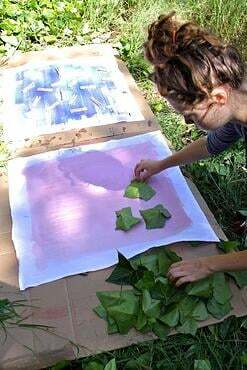 Who knew that you could use freezer paper and paint to add a design to a t-shirt? I didn’t until I found this tutorial on how to do it, and it looks as simple and fun as the pictured results. 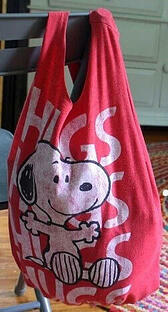 Basically all you need to make this tote bag is an old t-shirt, sharp scissors, and 10 minutes. 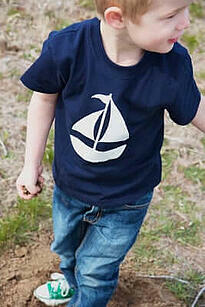 This no-sew project is a great way to repurpose a t-shirt that is too big or no longer worn. Personalize an old hand-me-down (or even cover up stains or holes) by adding some 3D art to your clothes! You can buy patches, pins, and appliques at craft stores and online, or you can make them yourself! 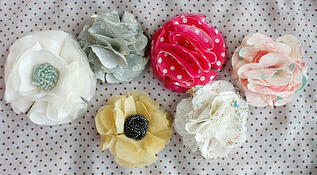 See this tutorial for no-sew felt appliques and this tutorial for no-sew fabric flowers. And if you’re up to the challenge, you can try making embroidered patches by hand. To make your own printed clothing, all you need is a stamp and some paint! You can buy stamps of all kinds at your local craft store, or you can make a quick DIY stamp out of a kitchen sponge, sponge brush, or even a potato! 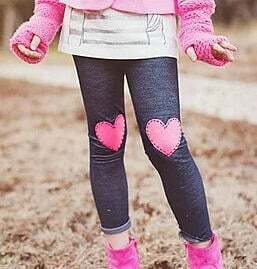 Then simply dip your stamp in acrylic or fabric paint and press it onto any piece of clothing that you want to make 100% cuter. 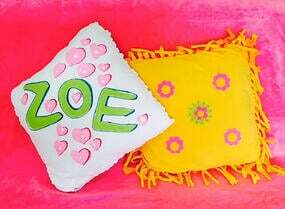 Your child doesn’t have to say goodbye to that beloved t-shirt that has become too small to wear -- preserve it as a throw pillow! 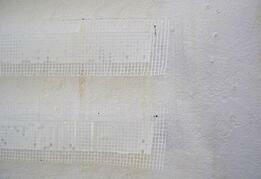 Try the no-sew, hand sewed, and machine sewed version depending on your available equipment and skill level. 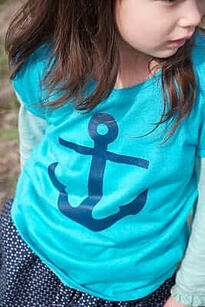 Leave the shirt plain or embellish it with buttons, sequins, fabric stickers, or paint designs! 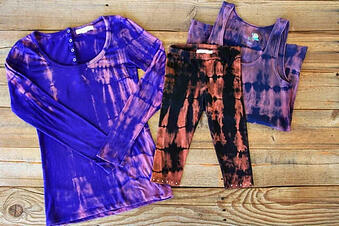 Looking for something different from the average tie-dye or bleach methods? Try using some Elmer’s glue to draw a design or make a pattern with found objects and let the sun do the work! 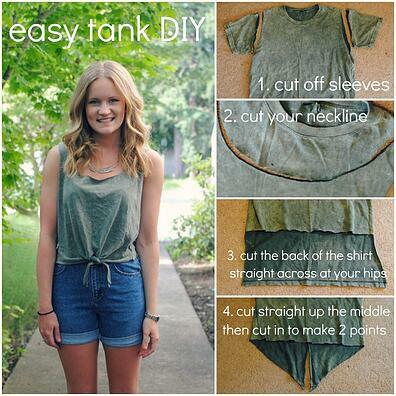 Cutting up a top is a surprisingly popular DIY project -- and there are sooo many ways to do it. Turn a regular old t-shirt into a cold shoulder top, workout tank, or tie-front tank. Also, don’t hesitate to explore the internet for hundreds of other ideas. 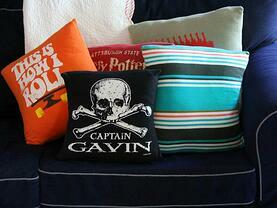 If you're looking to use an old shirt in a completely new way, you can repurpose t-shirt fabric! From a simple headband to a woven pillow, t-shirt “yarn” has many colorful and practical applications. Embrace the timeless style of a peplum shape in your upcycling endeavors! 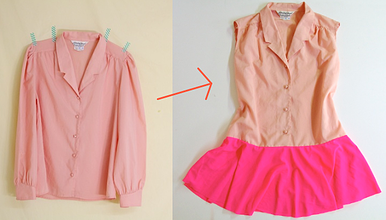 Convert an oversized t-shirt into a peplum top or increase the charm (and length!) of a shirt by adding a different colored fabric for a trendy color block effect. While this project can be created through hand sewing, it is also an excellent way to practice and develop basic machine sewing skills. 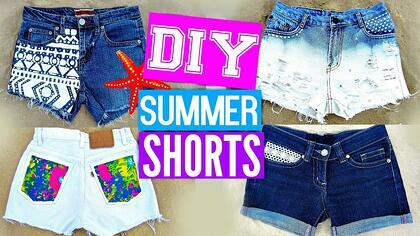 Cut an old pair of jeans into shorts and make them stylish using a variety of techniques! This video shows how to do modifications such as adding lace, bleaching, painting, and adding patterned fabric. 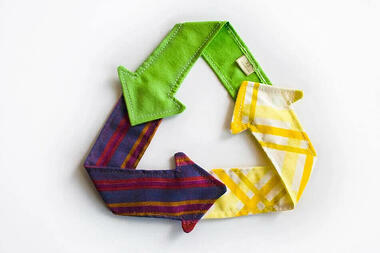 Have fun with your new, upcycled clothes! And don’t forget to share your upcycling projects with us on Instagram using the hashtag #SewMoreLove so we can see your wonderful creations! If you and your family is feeling inspired after your adventures in upcycling, make sure to check out The Handwork Studio’s camps and classes so your child can continue to make more handmade art! Our students flourish in our nurturing environment, and we encourage creativity and original projects while developing handwork and needlework techniques for multiple skill levels. Register now or join our mailing list for the latest news and summer camp info.